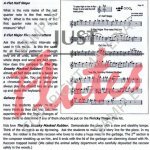 The Teacher’s Manuals provide an in-depth guide on how to implement the Flute Method. For example, the use of the Pneumo Pro is fully explained and all aspects of technique, theory and composition are fully explored. Extracts from the student books are reproduced with guides showing the skills required and how to teach them. It’s all linked together very well and is almost a mini curriculum in itself. In the first book there’s even a page on to how to charge your students! The ethos behind these books could be incorporated into any teaching method very successfully. Instructions of how to use the Pneumo Pro with beginning students, and how to incorporate the five-note patterns into the main body of the method book are included. 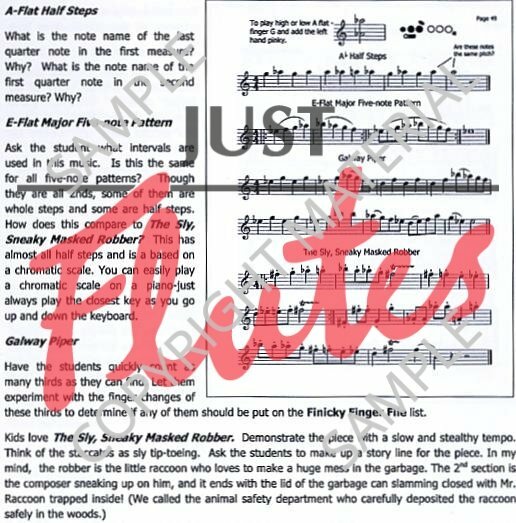 The Blocki Flute Method’s unique approach to teaching Five-Note patterns has proven to consistently help even the youngest students develop exceptional technical abilities. Five-note patterns are used as the foundation for teaching new notes, technique, moving between beat levels, simple transposition and fun and easy ear training. The method is designed so students can play in both octaves without having to read the notes in both octaves. This is an incredibly important aspect of teaching beginners. Teaching flute is not like teaching trumpet in which the high notes are more difficult. High notes become difficult when students only play in the low and middle octaves for as much as one year. The students then have trouble with embouchure flexibility, and the ability to form a smaller lip opening. Because of the combination of a systematic approach to note reading, fun composition projects, fun ear training games, and basic theory, this book is also an excellent supplementary book for Suzuki teachers. Page-by-page instructions correlate with each section in the student book. This is also an exceptional text for university woodwind techniques classes, especially when used in combination with the Pneumo Pro/ DVD kit.